From left are Josh Furlong, NCCFD firefighter/medic; Nicole Schoening of Invisible Fence; and Nick Kamaka, NCCFD firefighter/EMT. 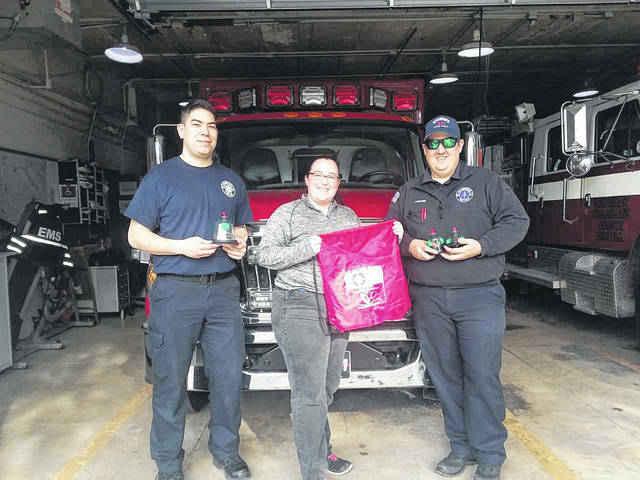 NORTH LEWISBURG – Invisible Fence of Dayton and Columbus West has donated pet oxygen mask kits to the Northeast Champaign County Fire District. The Invisible Fence Brand’s Project Breathe program was established with the goal of equipping every fire station in America and Canada with pet oxygen masks, according to an Invisible Fence news release. These masks allow firefighters and EMS staff to give oxygen to pets suffering from smoke inhalation when they are rescued from fires and often save pets’ lives. Invisible Fence Brand has donated more than 18,700 pet oxygen masks to fire stations all over the United States and Canada. A reported 180-plus pets have been saved by the donated masks, one family dog most recently in Baltimore by the Baltimore County Fire Department. North Lewisburg and surrounding areas are joining the ranks of cities like Seattle, Chicago, Denver and Salt Lake City in receiving donated pet oxygen masks from Project Breathe program. Although the number of pets that die in fires is not an official statistic kept by the U.S. Fire Administration, industry web sites and sources have cited an estimated 40,000 to 150,000 pets die in fires each year, most succumbing to smoke inhalation. In most states, emergency responders are unequipped to deal with the crisis. The loss is terrible for the family, heart-wrenching for firefighters. The company has set up a website, www.invisiblefence.com/O2, where fire personnel can make requests for their departments. Submitted by the Northeast Champaign County Fire District.